Mean streets. The way I see it, it’s a lose-lose-lose situation. I’m talking about the simple act of getting from here to there and back. Take last Monday, when the calendar read, "Berkeley, 6:30." For those of us who try to retain the remaining tatters of our sanity, a trip from San Francisco to Berkeley normally means a trip by BART. Particularly during rush hour. But for many of us, an evening trip also entails careful logistical calculations about the return. In my case, do I get off at 24th Street and walk across the Mission, a lone figure casting long shadows on the silent sidewalks? Or do I get of at Powell and wait… and wait… and wait for the bus that will deliver me nearly to my door? On Monday I took the coward’s way out and drove. No, actually I sat, logjammed, light-headed from inhaling the foulfumed air, ears clogged with the grumble and growl of a hundred infernal combustion machines, wondering where anyone got the idea that this is the best place on earth. Wondering if Thomas Blalock, president of the BART Board of Directors, sleeps well with the knowledge that his shiny silver trains make possible a round trip to nowhere. Wondering if Michael Burns, MUNI general manager, sleeps well with the knowledge that his billboard buses go to sleep with the chickens. Alley-oops! The city, in its infinite wisdom, is demolishing its alleys. 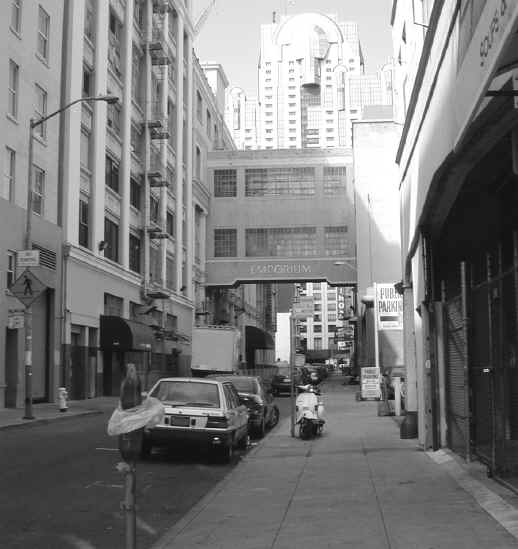 Last month the Supes voted to vacate Tenny Place and Sloan Alley and sell the tiny streets near Howard and First to Fritzi Reality for $993,000. Why? They stood in the way of Fritzi’s mono-block "office project with associated retail uses and underground parking." A couple of weeks later, the Supes struck again, this time at poor little Jessie Street. They voted to "vacate" the street from Seventh and Eighth Streets to make way for the planned 675,000-square-foot federal office building on that block. And they called for a public hearing on August 28 to discuss their proposed sale of Jessie between Fourth and Fifth to the developers of Bloomingdale’s for $3.1 million . 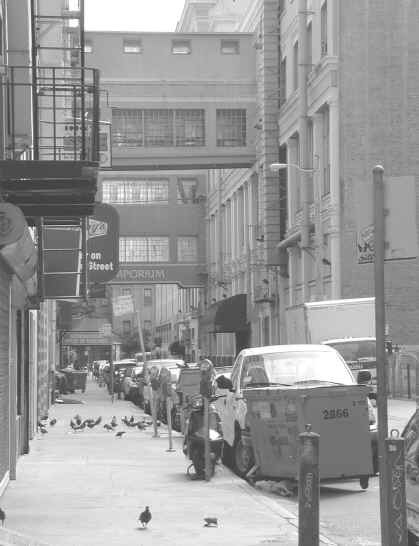 One of the few charms of the area south of Market is its collection of tiny roadways, sometimes only half a block long, providing human-scale relief from the clamor of the major thoroughfares. They’re a Jane Jacobs dream come true. One of the urban-planning doyenne’s cardinal rules is lots of short blocks: "Streets and opportunities to turn corners must be frequent." Without them, people in a neighborhood travel directly to and from their destination, with no reason to pause elsewhere. No reason to form what Jacobs calls "reasonably intricate pools of city cross-use." No reason to create a truly diverse area or develop its full potential. In other words, all roads lead to Bloomingdale’s.